Former India batsman Gautam Gambhir, along with sports technology firm Funngage.com has launched a nation-wide programme for Cricket Scholarship, the first of its kind for sports in India. Named ‘FG PowerPlayer’, through this programme, boys and girls in the age group of 12 to 24 years will get a fully paid for cricket development scholarship with a three-week of fully paid for training camp in Perth, Australia at Guildford Grammar, under the guidance of former South African Test cricketer HD Ackerman. It is a Pan India initiative and after successfully conducting trials in Delhi, Noida, Meerut, Chandigarh, Jaipur, Mumbai, Pune, Patna, Ranchi and Kolkata, the sports platform – Funngage.com is now starting with the southern India leg with Bangalore being the first city. The trials will be conducted in FG academy. However, with a successful collaboration, Cricket Academy of Pathans (CAP) is the preferred academy partner for the scholarship programme. “It is a fabulous platform for all the youngsters to come and showcase their talent. They are going to select 120 and out of that 60 will go to Australia in four batches (15 each). It is a transparent platform as well. 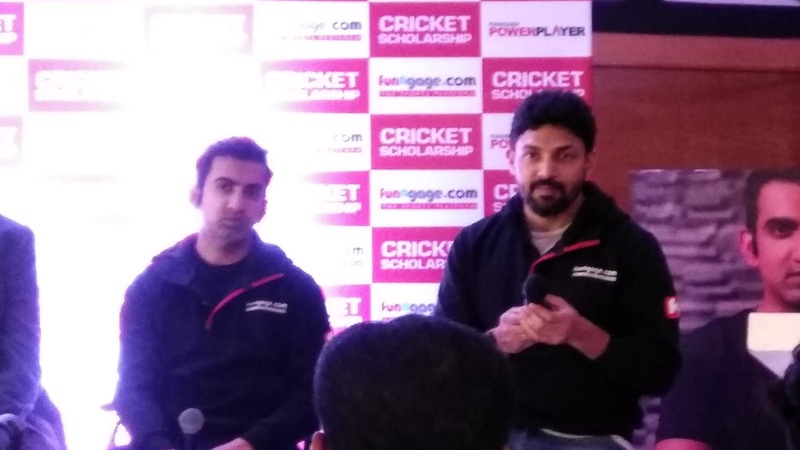 It is an initiative where you will get a lot of kids from the grassroots,” said Gambhir addressing the media at the M Chinnaswamy Stadium. The selected students from Funngage PowerPlayer trials will get an opportunity to be trained for five years in CAP academies under the guidance of cricket experts and coaches. These scholarships will help in unearthing new talent and give young kids a platform to kick-start their budding cricketing careers. The Bengaluru trials will begin from January 27 at Hyper Turf Cricket Ground, Yelahanka. “Through this platform, we want to ensure that anyone who wants to realise his or her dream of being a cricketer can do so. It’s an Initiative to help the cricketers develop their skills and not worry about finances. Funngage doesn’t claim to make anyone play for a state or any BCCI affiliated team or in any League. The cricketers need to follow the selection norms set by the respective cricket associations to get through there. We are here to ensure that all kids get their performance stats and none should be deprived of Good Cricket Coaching and facilities due to lack of funds,” said Karan Singh, founder & CEO, Funngage.com. How to register for trials? Registration for trials can be done at www.funngage.com or by downloading the Funngage mobile application from Google PlayStore for Android users and App Store for IOS users. Registrations can also be done at Funngage counter set up at Hyper Turf Cricket Ground, Yelahanka and at 24/1, First Main, Chunchappa Block, RT Nagar from January 24 onwards from 11 am to 7 pm. The basic and only administration fee to register into the programme is Rs 1,050 (all-inclusive) for batsmen and bowlers and Rs 1,950 (all-inclusive) for all-rounders and wicket-keepers. Initial trials are held on center wicket of the ground with at least 5 High Definition (HD) cameras making ball by ball videos of each and every cricketer. These videos are shared with players on their Funngage account for their view and records. These videos are also shared with top coaches on Funngage, for them to assess and do a performance assessment for each player. The detailed report card and assessment scores highlighting their strengths and areas of improvements are given to each player. Round 4 – Awarding Scholarship: Top 120 cricketers to get 5 years of Cricket Development Scholarship and top 60 to train for three weeks at Guildford Grammar School, Perth, Australia.